A homemade rain gauge is a fun and easy craft for kids and uses supplies you probably already have on hand at home. Whether your kids measure the rain for a science project or just for fun, it’s a cool way to measure how much rain really fell. You can measure one rain storm, or leave it outside to measure several rainfalls and add it up to see how much you got over a week. Remember: The water will evaporate between rain storms so it is best to check after each rain fall and write it on a chart (if you want to be accurate and scientific), and dump the rain gauge so it will be empty again for the next rainfall. After it rains again, add that measurement to your chart and add it up! Hello math skills! Note that you can also use this homemade rain gauge as a homemade snow gauge! Measure the snowfall, or even how much water the sprinklers left on the lawn. Place the ruler in the jar so the end of the ruler (where “0” is) touches the bottom of the jar. Tape the ruler to the side of the jar so it stays in place. Your rain gauge is ready! Don’t you wonder why you haven’t made a ton of these? Find a good spot outside for your rain gauge (in the open where the rain can fall into the gauge is best–i.e. not under a tree or sheltered by the house) and see how much rain falls. So? How much rain did you get? 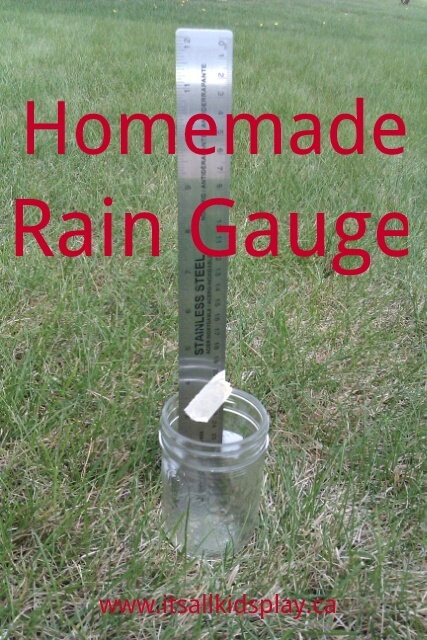 Have you made a rain gauge? How did your work out? What supplies did you use?